So You Don’t Think You Can Make a Greeting Card? You too can make a greeting card. Yes. I might not know you personally. However, I know that if you were skilled enough to find this site, then you are already skilled enough to put together a greeting card. The only thing I cannot answer for you is: "How creative do you want the card to get?" Why don't I have this answer? Some creative card making methods are simple while others are complex. Some even lead to unique card creations. The easiest way to put together a greeting card is to find a card you like that comes with card making instructions, then re-create it. The instructions save you the time, effort, and stress of decoding how the card was puzzled together. 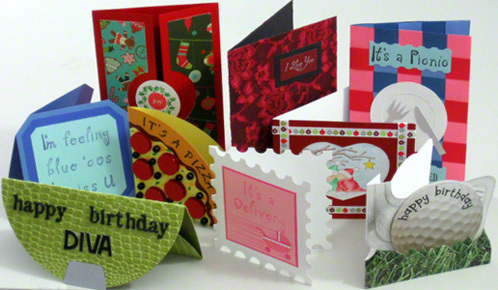 If, instead of this option, you want to use your expertise to make your own greeting card, that’s great too. Whichever method you choose, one thing is certain. You probably don’t want to postpone your project halfway because you ran out of greeting card supplies. The trick is knowing exactly what you need for the card then getting it all before actually starting the project. Good card making instructions will list all the required greeting card materials. Simply go through the list and check off what you have or don’t have. By the way, this is another benefit of using already existing instructions. For this, simply run to the nearest art and craft store and pick up what you need. Also, sometimes, the greeting card instructions have links and options for locating the supplies. If you can't find it in the stores and all else fails, contact the card creator. There are two main categories of greeting card supplies. They include consumables, like sheets of card stock paper that are actual raw materials for the card, and equipment, like scissors that help create the card. So, if you plan to make this single card (and only this one time), then the buying decision probably depends on how cheap or expensive the equipment is. However, if making other cards in the future (and hopefully, you do), the equipment will come in handy because you won’t have to buy them again. Hence, saving you money every time you create a greeting card. Whether you realize it or not, every completed project seriously increases you card making confidence. In other words, hope you decide to create more cards. Firstly, the person you send the next card to would also appreciate it. Secondly, when you make a greeting card, you create an opportunity to inspire the world. So don’t keep your creation to yourself. Share your creation and story. Finally, each time you create a greeting card, it further proves the first point at the beginning of this page: You too can make a greeting card.